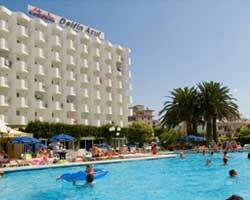 The Delfin Azul hotel is located in Alcudia, Spain. It has a great location, just 0.2km from a sun-kissed beach, in a beautiful area offers plenty of shops and bars. The complex is perfect for families, with an amazing animation team, a huge swimming pool and children’s playground. The team are warm and friendly, happy to help at any time. The hotel is situated approx 60km from Palma Airport and 0.2km from Alcudia beach. Facilities within the hotel include a large swimming pool (with children’s section), a children’s playground, safety deposit boxes (may charge) and daytime and evening entertainment. The rooms feature a satellite television, air conditioning (may charge) and a balcony/terrace. The All Inclusive option includes breakfast, lunch, and dinner, with locally produced alcoholic and non-alcoholic beverages on offer (times may vary).